This was testimony intended for the Texas Commission on Public School Finance. It was not allowed to be read aloud on 3-19-2018. This is primarily, though not exclusively, directed at the members of the senate, the Lt. Gov, and the Gov. I am not here to make nice. I will not share the incredibly wonderful things our kids, staff, and community do, and I am not going to leave you with any implication that Fort Davis ISD is ok with the minimal contribution from the state. I do not presume to speak for other districts in the state, but, I am sure that our situation is not unique. I have sent several emails to you documenting the financial history and status of FDISD. That data, and those charts, contain NO manipulations, normalizations, or other statistical gyrations…it is clean, neat, and real. 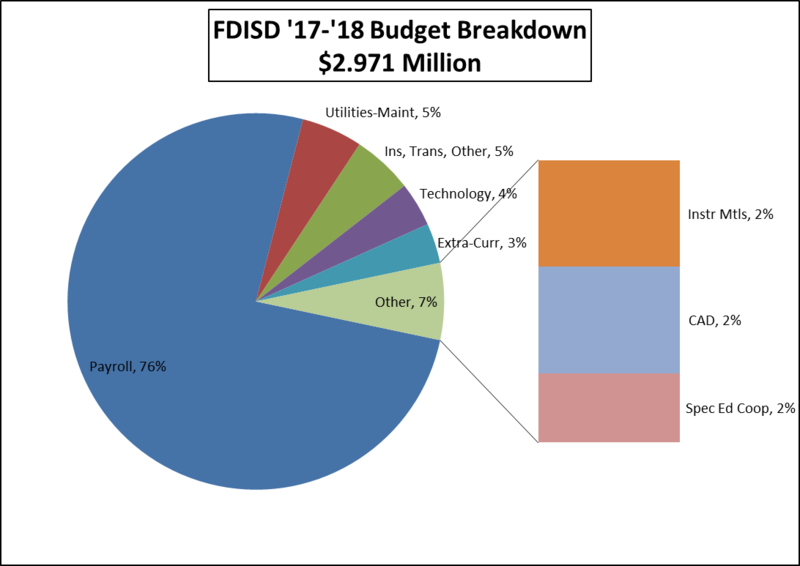 FDISD went from receiving 70% of our funding from the state to 15% this year, and an estimated 6% next year. We have no band, no bus routes, no cafeteria, no teacher housing, reduced electives, reduced staffing, frozen salaries, had parents making meals for extra-curricular trips, passed a TRE (2 attempts), cut stipends, renegotiated service contracts, and pursued cost saving projects on utilities. We have no corporations, no utility companies, no mineral values, no meaningful commercial activity, and no wealthy donors. We (the community) worked our way through a record cold spell that cracked water pipes all through town and homes, and then dealt with the devastation of the Rock House Fire just a few short months later. All we have for our local tax base is home owners, ranchers, and a few small businesses. Most of my teachers have at least 5 preps…some have 7. I have three central office people…me, my assistant, and my business manager. Our primary instructional buildings were built in the 1920’s, with one addition in 1973. I have one science lab in the district, built in 1973 at the junior high-high school. We use many pieces of second hand athletic equipment. Given all that, I have no patience for assumptions, insinuations, or outright lies that we just don’t know how to properly manage our money and high property taxes are the school’s fault. Any moral authority the state may have had over every other expectation regarding public education that is not in the Constitution disappeared long ago. In fact, I am disgusted with the propaganda being pumped out by the aforementioned politicians. Education is repeatedly highjacked for political purposes, then conveniently pushed aside when the heavy lifting is needed. The fact that some of you continue to claim that the state’s Property Value Study is not responsible for higher local taxes is a sleazy shell game. I refuse to accept your excuses that a main issue is revenue. The issue is priority. I, and other responsible entities, do not get the luxury of using the revenue excuse when tough decisions have to be made, when I have an angry parent in my office complaining about their child’s favorite, maybe only, program being cut. Why do you get to use that excuse? I heard considerable testimony on everything except a finance system…where everyone agreed that the single most important factor in education is the “teacher.”….and, later, when it was beneficial to an argument that schools have plenty of money, some of you completely contradicted yourself by pushing technology (such as TXVN) as a substitute for teachers in more rural areas. I refuse to quietly sit by and accept the deliberate de-construction of the public school system. I say the state’s authority and interference should be commensurate with it financial support, which, in my case, would be next to zero. I sent you a model that, to be honest, is based upon the plan from the Equity Center; however, it does have its unique aspects. It is simple, transparent, and auto-adjusting. It is uses data that is already collected and reported, removes enormous waste in inequitable allocations, requires a substantial increase in the Basic Allotment, incorporates incentives for local districts that utilize rates over $1.00 without punishing those districts that do not, and creates more statewide equity by including a portion of I&S revenues in calculating a total allocation. I do not have the resources to analyze the effects of the model statewide, but, that model specifically provides FDISD and nearby districts with a more adequate and equitable amount of funding that would allow for more consistent long range planning and operation. 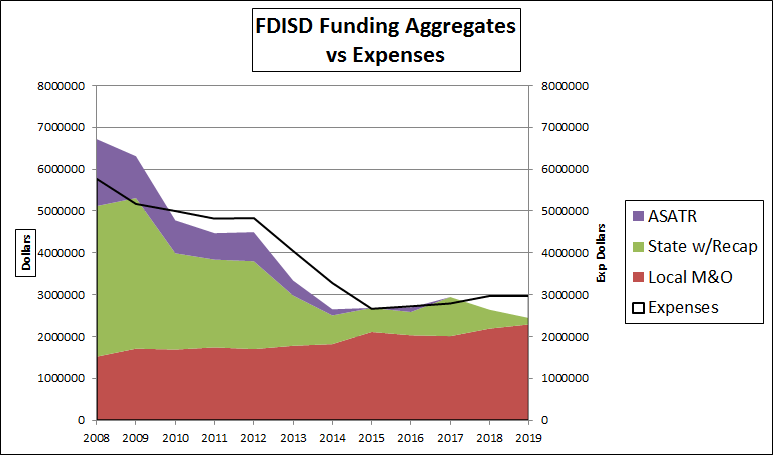 FDISD will be in danger of financial crisis in a few years without significant and substantial changes in the finance model. The legislature (specifically the senate) and the executive branch have not performed satisfactorily, for multiple years. Your accountability rating, therefore, is an “F.” You should be placed in the Legislative Improvement Program (LIP), and required to spend a minimum of $300 per hour, plus travel, for Legislative Improvement Monitor (LIM). To keep things simple, this process can collectively be referred to as LIMP. You should be required to submit monthly performance reports of not less than 30 pages, documenting your improvement efforts and periodic performance to the standard of equitable, efficient, and adequate public school finance. Review and approval authority for the process should lie with every other Texas citizen EXCEPT your constituents. Failure to adhere to the program and satisfy the requirements would result in accreditation loss and your removal. 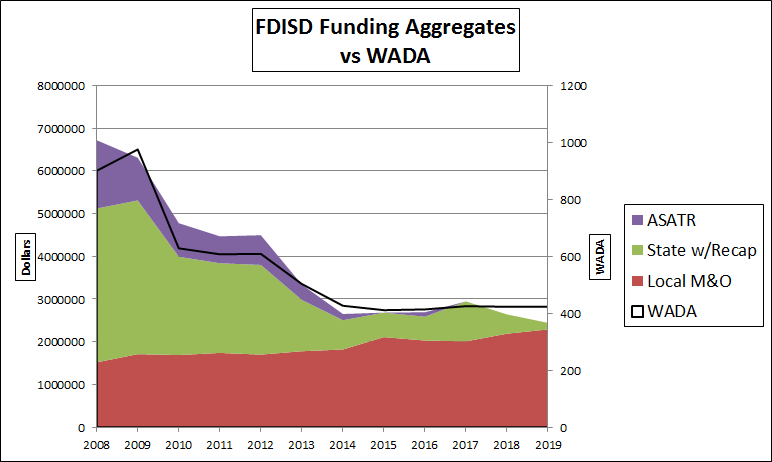 Inline image 2 This graph shows total funding, aggregated by type, compared to our weighted average daily attendance (WADA). The funding should follow the WADA...and it mostly does, until you get the this year and next. The disappearing purple is ASATR and the disappearing green is state funding (including recapture). Inline image 3 This graph show the inverse relationship between property values and our effective adjusted allotment...the lines move opposite of one another....notice 2018 and 2019. 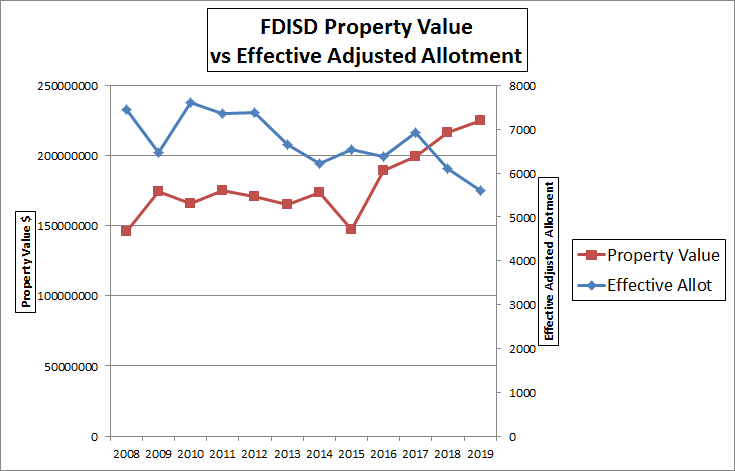 As property values increase (which is done by the state FIRST), the amounts allowed for districts drop (the WADA multiplied by the adjusted allotment)...requiring the district to maintain higher tax rates to offset drops in state aid. In a more equitable and efficient world, the effective adjusted allotment should remain as stable as the student population and demographics...in fact, it should be rising each year to account for inflation, given our stable student population. 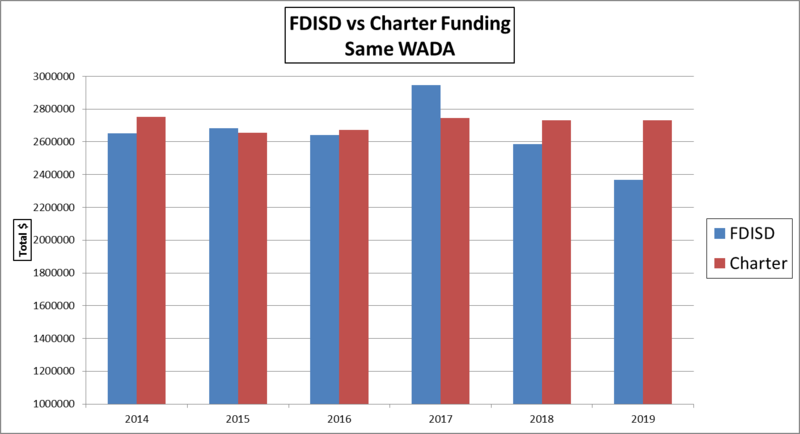 Inline image 4 This graph shows what an identical CHARTER school would have received in funding compared to FDISD....and, remember, charter schools have far fewer legislative and administrative requirements/regulation. It is interesting to note that a charter would receive more TOTAL funding in 4 of these 6 years....and, remember, charters receive 100% of their funding from the state (no local tax collections). It would seem that adding charter schools would only increase the amount of money needed by the state for funding??! !...oh, wait....they are just taking it away from the public school districts through reallocation. This graph shows the district expenses by category. The Special Education expense item is only for services to our 588 Special Education Cooperative. Other special education expense are included elsewhere in the other categories. The CAD expense is the district's share of expenses for the County Appraisal District.